Water consumption in Slovenia represents a relatively small proportion of the annual gross water outflow from the country. In 2014, the annual WEI index was around 2%, or, compared to the periodic average of water availability, 3%. 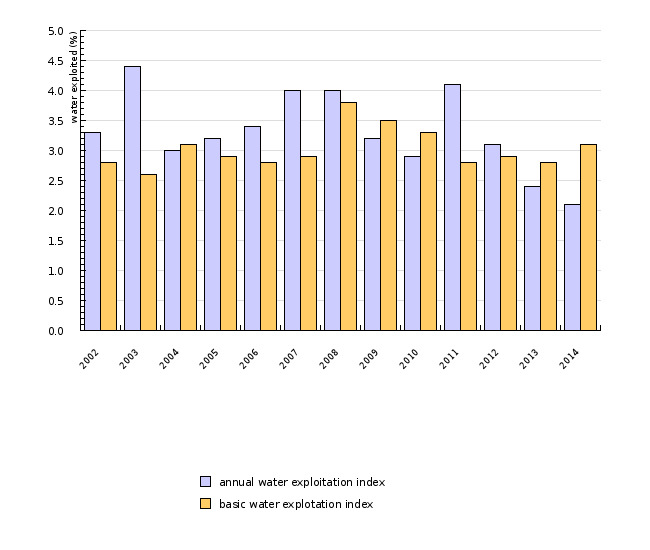 The Long-term Annual Average Water Exploitation Index shows a slight increase, but the trend is not statistically significant. The Water Exploitation Index (WEI) was introduced by the European Environment Agency (EEA) and presents the annual total fresh water abstraction in a country as a percentage of its long term average of available water. The WEI shows the abstraction of surface and groundwater divided by the average long term gross outflow from a country (basic WEI) or divided by gross outflow within a year (annual WEI). The data on water extraction is obtained from the Statistical Office of the Republic of Slovenia and excludes water used for hydropower generation in Slovenia. It includes water consumption for the public water supply provided to the population, industrial withdrawal, irrigation, etc., and water required for the operation of thermal power plants and the nuclear power plant. The data on gross outflow from the country is obtained from the Slovenian Environment Agency as an annual river balance based on the river discharge data. In order to estimate the vulnerability of individual river basins in terms of water quantity in the future, an analysis of the monthly WEI, based on the monthly mGROWA-SI water balance, will be required. Based on the WEI, Slovenia is not classified as a water-stressed country. Water stress occurs when the demand for water exceeds the available amount of renewable water during a certain period or when poor water quality restricts its use. The pre-alert threshold for water stress risk in a certain area is approximately 20% of water withdrawal in relation to the total quantity of renewable water or total gross water outflow from a country, while an alert threshold occurs when 40% withdrawal is exceeded. Compared to other countries, relatively small quantities of water are withdrawn in Slovenia. Cyprus has the highest WEI (more than 60% water is withdrawn), while the 20% withdrawal rate is also exceeded in Belgium, Spain, Italy and Malta. Water withdrawal rates are highest in Mediterranean and densely populated countries and lowest in Scandinavia.